themail archives Good evening, friends and colleagues, Reverend Nutall, Rabbi Stutman, ladies and gentlemen. Let me begin by thanking my good friend, Congresswoman Eleanor Holmes Norton, as well as members of the Council of the District of Columbia, the judiciary, ANC commissioners and civic, corporate and community leaders from across our great city. It’s a great honor to have you here this evening. I would also like to thank Congresswoman Corrine Brown and Congressman Trey Gowdy for being here tonight. I appreciate working with congressman Gowdy as chair of the House Subcommittee on the District of Columbia. I was delighted that when he became chairman last year, he took the time to come and visit with us at the Wilson Building to begin what has been a productive relationship. And, I want to thank the good people of the Sixth and I Historic Synagogue who have provided us this wonderful venue. As Reverend Nutall reminded us, this special place connects our past, our present, and our future. But most of all, I want to thank you the citizens of the District of Columbia for being here tonight and for being so committed to the civic life of this great city. As we gather here this evening, we are all well aware that today the District of Columbia is blessed with tremendous progress. And because of that I am proud to share that the state of the District is strong and getting stronger. In so many ways we are a city of firsts. We are the #1 retail market in the country, the #1 place for young professionals to move, #1 in foreign real-estate investment, #1 for the number of fast-growing private companies, #1 in metro household income, and #1 for quality of living in the Mid-Atlantic region. And one day, once again, we will be #1 in the National Football League. Our economy is growing and indeed is one of the strongest of any city in the country. The financial health of our city continues to improve, and just recently we announced that we ended 2011 with one of the largest budget surpluses in our history -- $240 million. The fact is, we have made great strides over the last year engineering a major financial turnaround and stabilizing our fiscal house. For the first time in years, the District is not spending from our critical reserve fund, which had been depleted by 700 million dollars over the prior four years. Indeed, we are replenishing that fund – often called our “rainy-day” fund – which now stands at $1.1 billion. The District has also seen a turnaround on jobs. In the last year we added 9,500 jobs. And looking off into the future, we project that by 2015 we will add another 45,000 new jobs to our local economy. But the problem is that while all of this economic growth is good for the city, some of our fellow Washingtonians have not yet benefited from the economic turnaround. They still struggle to find a job, put food on the table, and pay the rent. While economic growth is a priority, we must remain committed to getting our unemployed citizens back to work. To address this urgent need, last fall I launched the One City ● One Hire program, which provides pre-screening and job training, wage subsidies and tax incentives tailored to meet each employer’s individual needs and asks them to hire at least one D.C. unemployed worker. The results have been very impressive. More than 440 employers have signed up to be a part of the program – and, most importantly, they’ve hired more than 2,000 previously unemployed D.C. residents. And today – although it remains too high – our unemployment rate in the District is falling, from 11.2% to 10.4% in just two months. The population of our great city is growing for the first time in decades, as more and more people are attracted to the advantages of living in the District. Between 2000 and 2010 we added 30,000 people – but, in the last 16 months alone, we became the fastest-growing state in the country, adding another 17,000 residents. We are now more than 618,000 people strong – the first time the city has been home to this many people in over 25 years. And this growth shows no signs of slowing. Indeed, by 2025 it is projected that the District will be just shy of 700,000 people. And the District is not just attractive to people looking to move here. It is attractive to investors as well. Long-stalled development projects in all parts of our city are now under construction – adding jobs and retail choices, even in parts of the city where development hasn’t been seen in decades. Look across the city and you will see more than 30 cranes dotting our skyline. Through our capital-improvement plan, we are making strategic investments in public infrastructure that are leveraging more than $2.1 billion dollars in private sector investment, funding 14 major development projects under construction today – projects such as CityCenter on the site of the old convention center, CityMarket at O Street in Shaw, and the Shops at Dakota Crossing in Ward 5. And, yes, at last, significant development is emerging east of the Anacostia River – Wal-Mart is building two stores in Ward 7, one on East Capitol Street and another in the long-awaited Skyland shopping center. And we have worked with the residents and leadership of Ward 8 to establish an economic development plan for that important – but too-long and too-often neglected – area of our city. All told, projects currently underway have created 3,000 construction jobs – and, when they are complete, will create 6,000 permanent jobs. Moreover, another $9 billion worth of privately funded projects are in the pipeline that will add offices, housing, retail and other amenities – but, most of all, jobs. These include the Southwest Waterfront, Hine School, West End development, Nannie Helen Burroughs Avenue New Communities Project, and McMillan. The District’s housing market also is rebounding, and homeowners are cheering the news that once again the value of their homes is starting to rise. And we are making progress with education reform. According to key indicators, D.C. Public Schools are showing success in improving educational opportunity and achievement. The fact is, more and more parents are finding good reason to have confidence in District schools. And for the first time in decades, enrollment in D.C. Public Schools is stabilizing. And we will continue to implement our comprehensive school-modernization plan, rebuilding or renovating our schools. Over the last year I personally cut ribbons to open a new H.D. Woodson High School; a renovated Langley School; modernized and expanded facilities at Woodrow Wilson High School, Anacostia High School and Janney Elementary; and a restored Takoma Education Campus, where we invested $25 million unexpectedly in the aftermath of a devastating fire in December of 2010. We have also begun the modernization of Cardozo High School and broken ground on a new Dunbar High School. A new Ballou Senior High School and many others will soon follow. Our campaign to modernize every public school not only must continue, but we will find ways to accelerate it. Last summer, our reformed Summer Youth Employment Program engaged over 14,000 youth, teaching them the culture and value of an honest day’s work for an honest day’s pay. After years of dramatic runaway spending, we’re proud that last year’s program was very successful in serving our youth and came in several million dollars under budget. Among the basic priorities that all members of any community demand of their government is the expectation that their home, their neighborhood, and the city’s streets are safe. In 2011, the District had our lowest number of homicides in nearly 50 years. Although last year’s 108 murders were still 108 too many, this was 18 percent lower than the year before. And the Metropolitan Police Department posted an astonishing 95 percent homicide-closure rate – compared to the national average of just 56 percent. My administration re-opened our Police Academy, and the number of sworn officers in the Metropolitan Police Department is now increasing. Our target is to hire and train 300 new officers to grow our police force this year. The Fire and Emergency Medical Services Academy is now also up and running again to train new recruits, all of whom are District residents. And response time for EMS calls is improving as a part of our commitment to creating a more customer-friendly government. Also, I signed an executive order mandating that District law-enforcement officials not serve as agents for federal immigration law enforcement, thereby helping to build trust with our immigrant community and facilitating cooperation with the police. We must be One City – and that overarching ambition must include Washington’s immigrant community. And we continue to make strides to improve the health of our residents – especially those living with HIV/AIDS. To combat this epidemic – which continues to take a toll on the city, especially among African Americans, Latinos and among members of our gay, lesbian, bisexual and transgender communities – I appointed a commission of leaders from all across the city to guide our policies and to bring the community together in our struggle against the virus. The results of our work are clear. Deaths due to HIV and AIDS continue to decline. The city set new records this year for the number of HIV tests administered. We also cut the time between diagnosis and treatment – with 75% of those newly diagnosed connected to care in less than three months, another new record. No baby in the District of Columbia has been born HIV positive since 2009. These are real accomplishments in the fight against this epidemic. And the District is set to host the International Conference on AIDS this July – the first time in more than 20 years that this important gathering, 25,000 strong, will take place in the United States. And we have launched the Sustainable D.C. initiative – an aggressive effort to make the District the most livable, sustainable city in the nation. Recently, the U.S. Green Building Council confirmed that the District leads the nation in the most LEED-certified buildings per capita. And the District government is 4th on the list of the nation’s leading local governments who use green power. And the District’s new Green Building Act requires that all new buildings larger than 50,000 square feet must conform to green building standards. This law not only makes good sense for the future of the city, but also drives demand for construction workers in the building trades and workers in environmental remediation. Access to public transportation also is key in measuring a city’s commitment to sustainability. As we work with the region’s leaders to ensure Metro is an efficient and reliable means of transportation for millions, we are also committed to bringing streetcars back to D.C. We have proposed a 37-mile citywide streetcar system that is expected to attract up to 7,700 jobs, raise property values by $7 billion and generate as much as $8 billion in new development over the next decade. We will open the first line along H Street and Benning Road NE Next year. The Sustainable D.C. initiative is just one more example of the District’s forward-thinking approach to the challenges facing us in the years ahead. That is why I am committed to a government that is results-oriented – responsible, accountable and responsive to its citizens. And that is why in my administration, customer service will continue to be a top priority. We were pleased to see an independent researcher at Georgetown University conclude that the delivery of basic services in the city continues to improve. According to the analysis, on average it takes city workers five or fewer days to respond to basic problems. This is due to a better-managed workforce and an embrace of technology. But more importantly we are witnessing a growing culture among District government workers that residents are our customers and we are here, first and foremost, to serve them. As we celebrate the progress in our city, we also must recognize that our city is clearly changing dramatically. Our population, our economy, our jobs, our schools and our neighborhoods are all in the midst of an extraordinary transformation. Perhaps most notably, the demographics of our city are changing. The people the District is attracting are younger and more diverse. Moreover, the District is no longer a majority African-American city. And although I can understand that all this change at once is difficult for some who have lived here for many years, we must find a way to embrace the new while at the same time preserving what we love about the District that makes it so special. We must welcome new arrivals to our city just as we ask them to be good neighbors, respectful that they are making a home in a city rich in history and tradition. Increasingly, we are a people of every hue, ethnicity, age, culture and religion. My friends, after so much change behind us and so much change yet to come, the District finds itself at a crossroads. The question is: Will we sit, satisfied with the progress we have made over the past decade, content to let the next chapter in the District’s history simply write itself? Ot, will we seize this moment; seize the chance to grab hold of our shared destiny – to chart the course to the new future that we want for the District. And so, the fundamental question we face as a city at this moment is whether we will seize our future! Will we settle for a city where some are increasingly well-off while a large number live nearby in enduring poverty and without opportunity? Or will we forge our future together to develop a diverse economy accessible to all, where we grow the pie for everyone, where everyone does their fair share, and where everyone has a chance to succeed. Will we embrace the ambition that we are all better off together? And that, my friends, is where the vision of One City is absolutely critical. Now there are those who suggest “One City” is just a slogan – or an idyllic view of the District that doesn’t exist. Well, I am here to say I harbor no illusions of where we are right now. But I am also not afraid to dream of where we can and should be. “One City” does not mean we are all the same; far from it. Some of us do not share the same equality of opportunity that this country has espoused for generation after generation, while others bear a great share of the cost of a social safety net that, despite the best of intentions, too often traps people in a state of dependency and denies them the dignity of work. Admittedly, “One City” is an aspiration … a dream of what we can be. But it can also be a practical guide for how we share and shape our future together – a future where more and more of our people see and believe in rich vistas of opportunity; an environment where the American Dream is embraced as the District Dream. “One City” means that by choosing to live in this great city, we share the same civic destiny. We share a yearning to live in a progressive, prosperous, inclusive city. We choose to live here because we value diversity, because we know that living in a vibrant, multicultural city makes us better as a city and better as a people. And where every resident lives in the most environmentally sound, sustainable city in the world. My plan for building “One City” focuses on three priorities: 1. creating a new economy for the District that is growing and diversified; 2. ensuring that District residents are prepared for the jobs of the new economy; and 3. improving the quality of life for all. The new economy for the District of Columbia must be far less reliant on the federal government and less dependent on real-estate development that too often in the past was ad hoc and reactive. Instead, our comprehensive plan for creating a new economy must result in a diversified, more resilient, and more balanced approach to economic growth. And we cannot go it alone. We must engage important partners like our universities, non-profits, organized labor and the business community in order to more strategically reinforce our efforts. Our plan must first double down on growing existing industries that are already sources of economic strength – like health care and hospitality. But we must also invest in growing the jobs and industries of the future, especially in the tech sector. In fact, we want to be the tech destination city on the East Coast, a rival to Silicon Valley for talent and fast-growing businesses. We plan to attract to the District a strong presence of mature, well-established tech companies that can bring new energy. 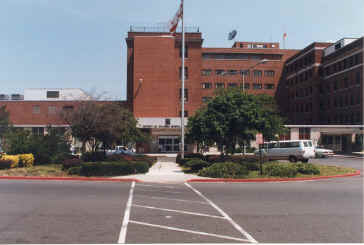 With the Congress Heights Metro station and a new Coast Guard headquarters across MLK Avenue, the east side of the old Saint Elizabeths campus is the perfect location for a new tech campus. But we also want to incubate, nurture, grow and retain a new generation of our very own tech start-ups. More and more, entrepreneurs are noticing our vibrant city. And even better, we are offering “D.C. Tech Incentives,” a series of tax breaks and tax credits that make clear to emerging companies that we want you here in the District of Columbia. We are already well on our way toward this goal, with companies like Living Social, Fortify.vc, HelloWallet, and newBrandAnalytics being launched and now thriving in the District. And in addition to tax benefits, thanks to the ingenuity of a small entrepreneurial team in the D.C. government, the District is now America’s first and only 100-gigabit city – meaning we have faster and greater broadband capacity than any other city in the nation. We believe this high-tech ring, soon to fully encircle the District; increasingly will be an incredible asset to help drive our high-tech aspirations. We must also look beyond our own borders for new untapped markets. The District cannot survive as an economic island. We know that 95% of the world’s customers and 74% of the world’s purchasing power reside outside the United States. To better access international markets – and thanks to grants from the Small Business Administration and the U.S. Department of Commerce – my administration has launched Export D.C., the District’s first major small business export development program. Initially focusing on South Africa, Brazil, and Asian markets, the District of Columbia will export our world-class human capital to spur economic development and create good, high-paying jobs here in the District. For example, in the next 10 years China is expected to build 30 billion square meters of construction that must be in compliance with new, more rigorous environmental laws. D.C.-based engineers, architects, and consultants – who already know how to do this because of the District’s forward-thinking work on sustainability – can take advantage of these market opportunities and meet the emerging demand. We have the talent right here in the District. Let’s show the world what D.C. residents can do! And to promote our exports and to promote D.C. as an emerging tech capital, later this year I plan to travel to China and make our case. Now, to build a new economy, we also must promote a culture of entrepreneurship, innovation, and creativity. This is one of the main reasons people are moving to the District. And, working with our schools and universities, we must lead that effort – not follow it. In addition, we have not one but two once-in-a-generation development opportunities with the campuses of Walter Reed and Saint Elizabeths. It’s critical that we get both of them right, not only in terms of capital and business assets for our city, but also in terms of job creation and growth. An integral part of the strategy for Walter Reed and Saint Elizabeths is that we are bringing more than 250 acres onto the city’s tax rolls, to say nothing about the value of those sites once they are developed. I will soon propose investing $50 million from our capital budget to build the necessary infrastructure to support the development of the Saint Elizabeths tech campus. Another key requirement for creating a new economy in the District is that we must make it easier for businesses to do business here. Over the last decade, we have made good progress in reforming the city bureaucracy and reducing red tape. But everywhere I go, I still hear complaints about how hard it is to run a business in the District of Columbia. If we are ever going to be “one city,” that must change. That’s why I will soon appoint a business-regulatory-reform task force made up of diverse representatives of the District’s business community to review the city’s rules, regulations, fees and tax structure, and to make recommendations to me about how we can make it easier for companies to start up, grow and thrive in our city. If we plan and successfully execute the multi-pronged strategy I have just described, we will have launched a new economy. And the result – more opportunity for everyone – will help us take a huge step towards the widespread prosperity “One City” requires. The second component of my “One City” plan is to ensure that District residents are prepared for the jobs of the new economy. As our economy grows and changes, we must work continually to close the skills gap, helping residents get up to speed with learning and training that makes them job-ready for the opportunities of the future. That is why our “Cradle-to-Career” initiative is so important, focusing on preparing our young people for the global marketplace of tomorrow. Investing in our own human capital will pay huge dividends down the road. As we build a new economy, we must ensure that our homegrown talent is ready to compete and ready to take advantage of it. Key elements of the Cradle-to-Career initiative are early childhood development, education reform and job training. We are the first city in America to offer universal pre-K, and we are now ranked #1 in the nation in pre-kindergarten enrollment. But if we are ever going to truly ensure that all our children are school – and eventually job – ready, we need to expand access to universal, high-quality infant and toddler care. Research shows that some of the most critical brain development occurs between birth and 3 years of age, and that investments in early childhood development pay huge dividends in closing and even preventing achievement gaps caused by environmental factors. That is why we are focusing significant resources on my “Early Success” initiative. An exciting new resource in our Early Success plan is the $12 million, state-of-the-art early childhood Educare Center in the Kenilworth-Parkside Promise neighborhood, which will provide services to 171 children and their families. Support for this center is provided by such blue-chip organizations as the Buffett Early Childhood Fund and the Kellogg Foundation. We broke ground last year, and it will be completed in less than 30 days. At the center we will test, learn and teach important best practices about early childhood development that we then will roll out more broadly in a coordinated, citywide strategy. Another critical component of the Cradle-to-Career plan is elementary and secondary education. Much good work has been done to reform our schools. But when it comes to education reform, we need to think even bigger. We need to set our sights on becoming the best urban education system in the nation. To do this, we must be a model of how the best public schools can operate in a healthy, virtuous competition with the best public charter schools to spur creativity, learning and achievement that prepares young people to compete in the new economy. And let me be clear: Though from time to time we may disagree about some of the details; I am a huge supporter of public charter schools. At DCPS, we are continuing to build a strong workforce made up of effective teachers and principals. We have dramatically expanded the quality of special education programming, enabling us to serve students closer to home and reduce the number of students attending non-public schools by 20% in just the past 11 months. We have seen gains in student performance as measured both by our DC-CAS test and by the National Assessment of Educational Progress. These gains have been especially notable in math scores for secondary students. However, as we all know, much work remains to be done. I have asked Chancellor Henderson to build on our successes, to redouble our efforts, and take whatever steps are necessary to accelerate improvement, raise graduation rates and help more students move beyond mere proficiency to advanced levels of achievement. And finally, my Cradle-to-Career initiative must include an overhaul of our job-training infrastructure. Job training of the past, however well-meaning, too often prepared people for low-skill, low-growth industries – and then we acted surprised when the jobs weren’t there. We must fundamentally redesign how we approach job training adapted to the needs of the 21st century. It must be data-driven and must equip people with the hard and soft skills necessary to compete for the jobs of tomorrow. And finally, the third component of my “One City” plan – improving the quality of life for all – begins with an emphasis on safer communities. The District took a huge step forward this year when we finished the year with fewer homicides than we had since the early 1960s. That achievement, combined with a reduction in all violent crime, translates into a far safer city for everyone. But even with this impressive accomplishment, much work remains. In the first few weeks of 2012, thefts were up over the same period last year – and in a few neighborhoods robberies were also up. In response to this uptick, MPD is using tools to disrupt both the offenders and the fencing operations that make this crime profitable. And since much of the crime has been driven by the theft of smart phones, MPD is working with the cellular phone carriers and the Federal Communications Commission to render stolen devices useless. Every crime is treated as a serious crime, and we will not rest until every neighborhood is safe. No resident, regardless of ward or neighborhood, should live in fear. Crime, whether it’s petty theft or armed robbery, will not be tolerated in our city, period – no excuses. Sustainability has to play a key role in the quality of life in our city. My goal is to make the District the most sustainable and livable city in the world. Already we are ranked among the top-10 greenest cities in North America – but we want to be #1. We are piloting a shift to L.E.D. lights in the city’s alleys, which has already produced significant energy savings. And we are starting to test L.E.D. lights for roadway lighting. My plan is to replace all 30,000 roadway lights over the next five years, using the energy savings to pay for it. Just last week I convened representatives of more than 40 embassies, who signed a pledge to adopt environmentally friendly practices and help support our campaign to be the greenest city in America. And in a few weeks, I will gather the District’s university presidents to sign a similar pledge. While we continue our investments in transit through expansion of the Capital Bikeshare program and the launching of a streetcar system, we also are exploring opportunities in renewable energy, especially solar energy. You can be sure that we are going to pursue every opportunity we can to make this the most sustainable city in the United States of America. A city can only be as good as its government. To ensure our residents have a high quality of life, we must provide them with the best return on their investment. Every tax dollar should be spent wisely on a government that works, and every public servant must remember who they are working for. While the independent study I spoke of earlier gave us high marks for customer service, we can and must do more; we must step up our game. That’s why we are creating Grade.DC.gov, powered by DC’s own newBrandAnalytics. It will allow residents to instantaneously provide feedback on city services using their smart phone. We will launch a pilot of this first-in-the-nation system in the coming months. When it is fully operational, we will have a transparent, real-time grade for every District agency. Now, there isn’t a mayor or governor in the country who wouldn’t trade their financial picture for ours in a heartbeat. But we are not there yet. Despite the fact that we ended 2011 with a significant surplus, we must not give in to the temptation to relax, let down our guard or abandon our commitment to fiscal responsibility. Now is not the time to stray from that discipline. Given an uncertain economy and the prospect of dramatically reduced federal spending that would cause shockwaves throughout our local economy, we must stay the course on fiscal responsibility. If things improve, let us all be pleasantly surprised. But I won’t let us go back to the dark days of spending hundreds of millions of dollars a year from our rainy-day fund because we didn’t or wouldn’t make responsible fiscal choices. We also must step up our campaign to press the national agenda to resolve our issue of self-determination. For without a voting voice in Congress, no citizen has a voice in the national government. You can be assured that I will continue to do everything in my power to press for full rights for residents of what should be the 51st state. And, yes we should become a state before the moon does. But if we are to be successful, everyone must join the fight. As a down payment on what is owed to us, I call on the Congress to enact a clean budget-autonomy bill, free of any riders that would override the will of our people. Grant us the power to spend our own local money without congressional interference. Now, all of our elected leaders – myself included, of course – need to exercise excellent judgment and be ever-vigilant in how we discharge our responsibilities. When I ran for this office, I promised to restore people’s faith in District government. And while we have taken positive steps towards this goal – like getting the District’s fiscal house in order – we fell short through a series of missteps early in my administration. I understand why people were disappointed, and I take full responsibility for those mistakes. In response, we brought in new leadership and instituted strict new hiring policies to ensure we bring into my administration only the most qualified appointees focused on moving the District forward. This is a start at earning back people’s trust – and I will work every day to continue to achieve that. We took another important step to restore people’s faith in government when we mandated transparency in our operations – and I have put in place tough policies that will ensure that our conduct in service to the people of the District of Columbia is always consistent with the highest ethical and legal standards. We have developed a comprehensive ethics manual and training program that is now being rolled out across the D.C. government. A few months ago, I instituted an ethics pledge for me and the members of my Cabinet. The pledge affirms that government employees are public servants and guardians of the public trust. In the months to come, every District government employees will be required to sign this pledge. And, as I have demonstrated as recently as yesterday, we have no tolerance for fraud or malfeasance in our government. At the end of 2011, the Council passed a meaningful ethics-reform law. And I want to congratulate and thank the Council for taking action on this important issue – and I look forward to working with it to implement this legislation. In an effort to continue the conversation about working to be One City that we started this evening, this Saturday, the people of the District will have the opportunity to attend the One City Summit at the Convention Center. I hope all of you will join me in an important statement about the value of participatory democracy. As we contemplate the future of the District of Columbia, we have before us a chance to remake and reinvent our city for the next generation – by creating a new economy, preparing our residents for the jobs of tomorrow, and improving our quality of life. My friends, let’s take advantage of this moment in our city’s history to seize our future, harness change for the better, and build the elusive One City that we all dream of. Let’s get to work, ladies and gentlemen!